Cripsy lentil-based pan cake topped with chopped onion, tomatoes, lemon juice, cottage cheese and sprinkled with chat masala. Onion mixed with chickpea flour, spices and deep fried until crispy. Deep fried pastry filled with potatoes, mild spices and green peas. Fresh assorted vegetable dipped in mildly spiced chickpeas batter and fried. Deep fried balls of sago mixed with mildly spiced mashed potatoes served with mint sauce. A South Indian dish, the amazing and super scrumtious taste of rava cutlets flavoured with roasted spice, mix vegetables and curry leaves will surely make you tempt for more. Marinated indus made cottage paneer dipped in a batter and deep fried makes a crispy mouth-watering snack. Mushroom marinated and roasted in tandoor with capsicum and onion. Delicious and extremely popular Indian snack, is stuffed using mix vegetables, nuts mint perfume and few spices. (Special Inuds Dish). Chunks of cottage cheese delicately marinated, roasted in tandoor with onion and capsicum. Platter consists of veg pakora, onion bhaji and cocktail samosa served with tamarind sauce. Boneless piece of chicken marinated with cheese, cream, lime juice and spices roasted in tandoor to a mouth melting finish. Boneless pieces of chicken marinated with yogurt and spices roasted in tandoor flavoured with cashew nuts. Combination of chicken and seekh kebab with spices roasted in tandoor. Delicious kebab from Mughlai cuisine, marinated in Indian style with spices and yogurt and roasted in tandoor. This is served with mint sauce. Chicken wings marinated with yoghurt and combination of spices roasted in tandoor and served with mint sauce. Tender rolls of lamb mince with exotic spices cooked in tandoor. Deep fried battered fish punjabi style, served with mint sauce. Chunks of fish delicately marinated and roasted in tandoor. Delicious lamb chops marinated overnight with kiwi-fruit and herbs and spices, roasted in tandoor. Whole chicken marinated with yoghurt and combination of spices roasted in tandoor. Prawns delicately marinated with spices and lime juice, skewered and roasted in tandoor with onion and capsicum. ish piece cooked with coconut gravy and tempered with mustard and curry leaves. Hot and spicy specialty from Goa and made with chillies, garam masala, garlic and vinegar. Boneless fish cooked in creamy tomato gravy. Boneless fish pieces cooked in onion tomato gravy and tempered with ajwain. Prawns cooked with juliennes of onion, tomato and capsicum tempered with pounded coriander and cumin seeds. Cooked in subtly spiced coconut gravy & tempered with mustard seed and curry leaves. Prawns cooked with onion & capsicum in a tomato based semi-thick gravy. Prawns simmered in subtly spiced spinach gravy. Prawns Cooked in creamy tomato gravy. Prawns cooked in hot and spicy ground vindaloo paste, specialty from Goa. Prawns cooked with grounded almond and cashew nut in a creamy sauce. Prawns cooked in mouth-watering coconut gravy, tempered with curry leaves. Word famous delicacy, boneless tandoori chicken pieces cooked in rich creamy. Boneless chicken pieces cooked in creamy apricot sauce flavoured with nutmeg. Chicken drumsticks cooked in special indus sauce. Boneless chicken tikka cooked with onion & capsicum in tomato-based gravy. Cooked with confit onion, garlic, ginger, tomatoes, and spices. A dish with more onion. A choice of Chicken/Lamb/Beef. This mouth-watering dish is cooked with crushed tomatoes, onions, fresh coriander. Choice of Chicken/Lamb/Beef. Boneless chicken in yellow lentil gravy. Boneless chicken pieces cooked in a creamy mango sauce. 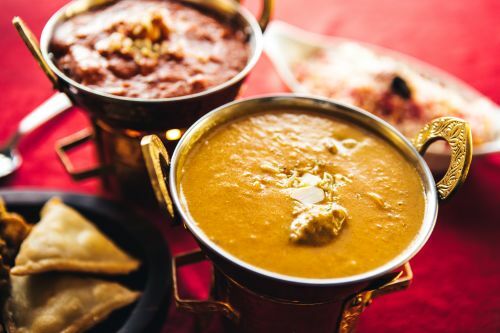 Tender lamb pieces in a rich golden gravy cooked in traditional punjabi style. Simmered in subtly spiced spinach gravy. Choice of Chicken/Lamb/Beef. Cooked with juliennes of onion, tomato and capsicum tempered with pounded coriander and cumin seeds. Choice of Chicken/Lamb/Beef. Boneless meat cooked with grounded almond and cashew nut in a creamy sauce. Choice of Chicken/Lamb/Beef. Hot and spicy specialty from Goa made with chillies, garam masala, garlic and vinegar. Choice of Chicken/Lamb/Beef. The dish is cooked with ginger and garlic, fried onion and tomato paste plus various aromatic spices which enhances its flavours. Choice of Chicken/Lamb. Fresh indus made cottage/potato cubes simmered in subtly spiced spinach gravy. Fresh cottage cheese cooked in creamy tomato gravy. Cottage cheese cooked with juliennes of onion tomatoes and capsicum tempered with pounded coriander. Peas and mushroom cooked in creamy sauce. Pouch of soft stuffed paneer are folded into creamy and tomato sauce made luxurious with cardamom perfumed butter. A rich and delicious fried stuffed paneer cooked in smooth creamy onion-tomato based gravy. Cottage cheese cooked with onion and chopped tomato. This mouth-watering dish is cooked with crushed tomatoes, onion, capsicum and fresh coriander. It has a thick gravy. Scrambled cottage cheese cooked with onions, peas, sultanas and cashew nuts. A harmonious combination of lentils cooked with butter and cream. Yellow lentils tempered with garlic & cumin seeds (Punjabi style). A combination of vegetables, dry fruits and nuts cooked in a creamy sauce. Cottage cheese and Potato dumplings served in a creamy sauce. Traditional Punjabi chick pea delicacy. Assorted vegetables spiced & tempered with cumin seeds. Fresh cauliflower & potatoes cooked with a mild hint of exotic Indian spices. Freshly diced assorted vegetables cooked in creamy tomato gravy. Cottage cheese / boneless chicken pieces deep fried and cooked with garlic, ginger, onion and soy sauce. Rice sauted with vegetables and soy sauce. This is Indo-Chinese dish made with prawns marinated in very simple battered paste and deep fried until golden in color. Sauteed vegetable, dry fruits and nuts tempered with cumin seeds, cooked with basmati rice, popular rice dish with no gravy, served with raita. A superb combination of meat, basmati rice, mild spices, dry fruit and nuts cooked to perfection and garnished with cashews. Popular rice dish with no gravy. Served with raita. Choice of Chicken/Lamb/Beef. Unleavened whole meal bread baked in the tandoor. Roti cooked with garlic on top. Literal meaning - bread thin as a handkerchief, a delight to watch in its making. Naan cooked with garlic on top. Naan stuffed with cheese and baked in the tandoor. Naan stuffed with cheese and garlic and baked in the tandoor. A selection of breads. (Plain roti, plain naan, garlic naan, peshwari naan and paneer kulcha). Naan stuffed with mildly spicy lamb mince. Naan stuffed with mildly spicy chicken mince. Unleavened whole meal bread with a flaky texture. Naan bread stuffed with indus made cottage cheese and spices. Naan bread stuffed with dry fruits and nuts. (Mughlai style). Onions seasoned with ground rec chillies, fresh coriander, lemon juice and chat masala. Cucumber, tomatoes, carrots, onions with coriander, touch of lemon juice and spices. oiled chickpeas mixed with chopped onions, tomatoes seasoned with fresh coriander, lemon juice and chat masala. Yoghurt mixed small fried balls made of chickpea flour and mild spices. Milk dumplings in rose and sugar syrup served with vanilla ice cream. Indus made creamy mango/chocolate flavoured ice-cream, served with mango pulp on top. With optional topping of mango pulp or chocolate sauce.